The Ionian islands of Greece are a beautiful collection of bays, beaches, ports, villages and small towns that are great to explore and discover. Every island has its own little story to tell and it’s own vibe as well as a distinct picturesque landscape. On this gay group trip, you’ll get to take in Corfu, Paleokastritsa, Paxos, Preveza, Fiskardo, Nidri and Lefkas all by boat, sailing the blue waves in a group with other gay men. This is an amazing trip you will never forget. On your first day you’ll board the boat and be welcomed by the crew with a welcome drink before being shown where you’ll be staying on the boat. you’ll have the opportunity to meet all of your fellow sailors before enjoying dinner all together as a big group in the historic old town. 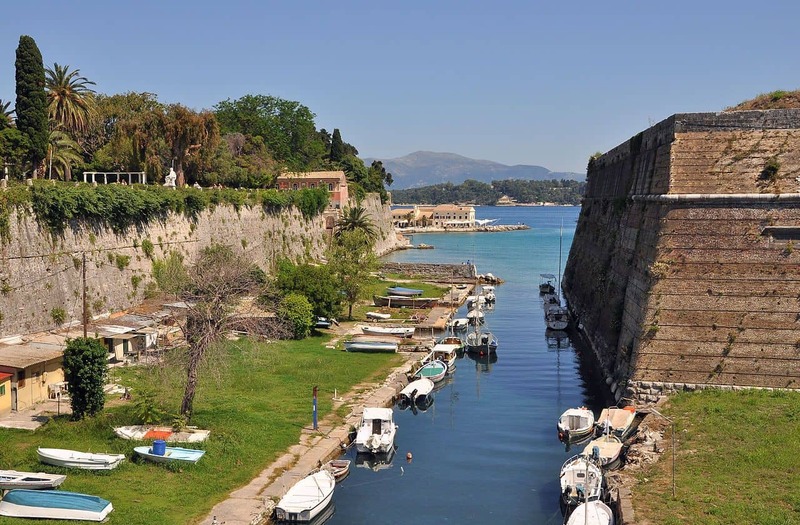 Paleokastritsa is the next stop on your journey sailing through the Greek islands, situated on the east coast of Corfu. Take a scenic walk up to the old fortress to experience the beautiful views over the bay before staying overnight on board. On the third day of your trip, you’ll enjoy sailing to the Island of Paxos, where you can wander around the little streets of the island’s capital of Gaios. You’ll find beautiful Venetian architecture, cobbled beaches and the beautiful blue caves of Paxos. On the fourth day of your trip you’ll sail some more on the clear blue waves, taking in the sunshine before dropping anchor at Preveza. Preveza is a lovely little town with a beautiful beach where you’ll all enjoy a BBQ as a group. From Preveza, you’ll sail down to the beautiful town of Fiskardo on the island of Kefalonia. This town is often cited as the St Tropez of Greece where celebrities have been pictured enjoying the picturesque beaches. Here you’ll all enjoy dinner in a local taverna. Set amongst the hills on the island of Lefkas is the village of Nidri – you’re next stop on your trip. It is possible to walk to entire length of the village in around 20 minutes and is in a stunning location. It is here that you will stay overnight and have lunch as a group on one of the private islands. The last day of sailing around the Greek islands will take you to the town of Lefkas on Lefkas Island. This ancient city is full of history and is a beautiful place to stroll around and explore if you’re someone who enjoys seeing the sights. The day has finally come where you must say farewell to your new friends and transfer back for your flight home. WHAT AIRPORT DO I NEED TO FLY TO? HOW LONG IS THE TRANSFER FROM CORFU INTERNATIONAL AIRPORT? It is only a short journey of 15-20 minutes to the port. DO I NEED TO HAVE PREVIOUS SAILING EXPERIENCE? No not at all, you can learn as much or as little as you’d like, there’s always the option to help the skipper with mooring the ship or alternatively, you can sunbathe and take in the beautiful rays. CAN I STILL GO ON THE CRUISE IF I SUFFER FROM SEA SICKNESS? Yes, of course, medication is sold on board if necessary but most of the routes the cruises take are between islands meaning that there is a low chance of violent waves. It is advised that you bring a small bag that can be folded if possible due to the limited space (suitcases not advised). Summer clothing, swimwear, a warmer jumper for the cooler evenings, toiletries and a rucksack to take ashore. WHAT PROPORTION OF GUESTS ARE SINGLES AND COUPLES? The cruises usually consist of 30% couples and 70% singles. IS THERE A SINGLE SUPPLEMENT? You can book a cabin for yourself at an extra charge, however, if the trip is fully booked you will be asked to share a cabin (usually a bunk bed or twin beds).